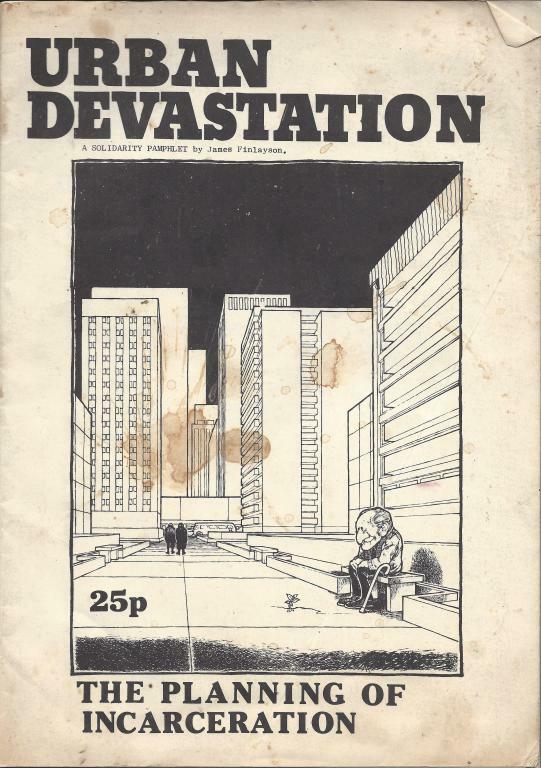 A pamphlet penned by George Williamson under a pseudonym, analysing urban development in the background of capitalist society and class struggle. Published by Solidarity (Oxford) c1976, much of it is still relevant. This pamphlet describes and analyses “the breakdown of the fabric of present-day cities in the light of the development of capitalism from the 19th century till now”, and “looks at the economic influences, the crisis of authority, breakdown of social order and the conflict of class forces as they affect the structure of the urban community” (p.2). In line with this perspective, the pamphlet recognises the need “to look at how the form, function and living patterns of urban areas are changing, and at how they could change within the framework of libertarian ideas” (p.4) One of its themes is the examination of the role of architects, planners, and engineers in the planning process under the bureaucratised capitalism and social-democratic engineering of the present society, and the potential role such professionals might play in the development of egalitarian and liveable cities in which “the urban fabric must become the creation of the whole population” (p.22). Although written in the mid-1970s, and drawing its examples from the development of urban areas in Britain up to that time, the analysis reflects general trends of urban development elsewhere, trends continuing into the present day. Writing under the name of James Finlayson, the author of this pamphlet was George Williamson (1939-2007), political activist, architect by profession, and Solidarity member for many years. Finlayson’s general “framework of libertarian ideas” reflects the influence of Cornelius Castoriadis, many of whose writings were translated from the French by prominent Solidarity member, Chris Pallis (aka Maurice Brinton), and published as Solidarity pamphlets under the name of Paul Cardan.